Tissue engineering has resulted in some remarkable achievements: skin substitutes, cartilage replacements, artificial bladders, urethral segments, blood vessels, bronchial tubes and corneal tissue substitutes. 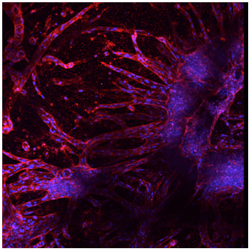 But these advances have been confined primarily to fairly simple organs comprised of thin structures, Denise Hocking, Associate Professor of Pharmacology and Physiology, noted at last week's Crossing Elmwood seminar. The need for patterning technologies that can reconstruct more complex tissue organizations. Maintaining cell viability with a sufficient vasculature of veins and arteries to supply oxygen and nutrients, and carry off waste products. "In thin tissues you can get away with this because oxygen and nutrients can diffuse across a few hundred microns; in larger tissues you are limited by lack of blood supply and lack of oxygen", Hocking noted. Hocking and Diane Dalecki, Professor of Biomedical Engineering and Director of the Rochester Center for Biomedical Ultrasound, believe that ultrasound -- the same technology that images fetuses in the womb, and breaks up kidney stones -- can help surmount those challenges. For example, their research collaboration has demonstrated that when an ultrasound standing wave field is developed within a solution containing cells, those cells will move to the equally spaced pressure nodes in the field, forming cell layers. By changing the frequency, the space between those layers can be adjusted; by changing intensity, the density of cells within those layers can be changed, all in three dimensions. These changes can be locked in by using a collagen solution, which can be polymerized with heat. Moreover, when this is done using endothelial cells as precursors for blood vessels, micro-vessels begin "sprouting" within one day, Dalecki noted. Furthermore, by changing the frequency and intensity of the standing wave field during the initial exposure to ultrasound, the actual structure and arrangement of the resulting vessels can be affected. Initial testing suggests this can also be done with endothelial cells for the lymphatic system. Dalecki and Hocking also have demonstrated progress in using ultrasound not only to assist in fabricating engineered tissue and its scaffolding, but to image the tissue before and after implantation to monitor its quality and performance. Ultrasound has some beautiful advantages in this field," Dalecki explained. "It is noninvasive, nondestructive, inexpensive; we can control our sound fields very nicely to tailor them; we can find optimized exposure conditions; and this can be easily incorporated into a tissue engineering environment in terms of sterility or bioreactors. Also, we can translate these techniques into the clinic because the ultrasound can propagate through tissue as a focused beam. The Dalecki-Hocking collaboration, she added, has not only produced some exciting research, but provided a really wonderful multidisciplinary environment for training our graduate students in our labs.